On my way back from Buenos Aires from the Argentine lake district (snug up against the Chilean border), I stopped in the provincial capital of Neuquén. Neuquén is one of those unloved but essential cities, like Inverness or Anchorage, that constitutes the only population center in a large expanse of nothingness and so consist entirely of big box stores, dealerships, billboards and administrative offices. Neuquén is also a transport hub at the gateway to Patagonia and the Argentine Lake District, with a massive new bus terminal to connect the several regions together. 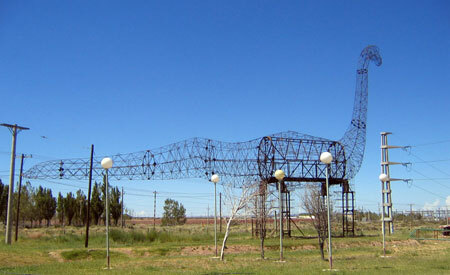 And Neuquén is also the place where Argentines extract prehistoric fauna from the ground, whether in liquid or fossil form. 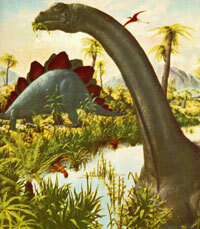 The region supplies most of the country's oil, and all of its record-breaking giant dinosaurs. I had come to see the paleontological museums in two little towns, Plaza Huincul and Villa El Chocón. Both are about an hour's bus ride away from Neuquén, in hot desert country that looks a lot like Nevada. Plaza Huincul is home to the largest herbivorous dinosaur ever found: the hundred-tonne Argentinosaurus Huinculensi; El Chocón boasts the largest carnivore, Giganotosaurus Carolinii, which resembles the Tyrannosaurus Rex in the same way that the Ford Expedition resembles a Jeep. Both sets of fossils were found here in the nineties, and there is widespread agreement that there are many interesting surprises still hiding here in the ground. Argentine law stipulates that even the most impressive and scientifically important fossil cannot cross provincial boundaries, let alone leave the country. So to see the original bones you have to go to Neuquén. Back when I was a kid, the dinosaur situation was pretty simple. Dinosaurs were dumb, lubmering lizards and the largest dinosaur of all was the brontosaurus, a cold-blooded giant that held its head up in an elegant curve and spent its life partially submerged in swamps in order to support its vast bulk. The only thing a brontosaurus had to fear was the occasional attack from the Tyrannosaurus Rex, king of the meat-eaters, who would stagger out of the forest roaring and waving his short, stubby arms. Stegasauruses grazed placidly on drier terrain, pterodactyls darkened the skies, and the oceans were filled with plesiosaurs. As fascination with living girls replaced my fascination with fossil reptiles, I lost track of dinosaur developments except for a vague sense that things were getting a little complicated. First came a series of dinosaur finds that were larger than the brontosaurus; then came the disconcerting news that there had never been a brontosaurus in the first place, just a misfiled apatosaurus, whatever that was. Meanwhile, in the meat eating camp, the T-Rex found its reputation so beset by scurrilous rumors that it was a carrion-eater that it lacked the energy to fend off a rival for "largest meat-eater", the allosaurus. After that, everything went to hell. The paleontological revisionism reached Orwellian proporitons. Instead of being cold-blooded swamp lumberers, it was suddenly announced that dinosaurs were warm-blooded - dinosaurs had always been warm-blooded! - and that they were intelligent and complex creatures capable of great bursts of speed. The giant plant eaters lost the graceful high curve of their neck and assumed the unexciting shape of a suspension bridge; the carnivores went in posture from a fearsome, chin-up, Tokyo-stomping swagger to something resembling a running chicken. Some scientists even tried to deck the dinosaurs out in feathers, or at the very least brightly colored skin. And then everyone got distracted by the strange things coming out of the ground in Patagonia. The bus to Plaza Huincul is a comfortable ride with sandwiches and cups of soda provided free - most of the passengers are on the far longer journey to the Andes. I jumped out at a desolate roundabout at the entrance to the town. On one side of the road stood a giant wire-frame dinosaur, on the other side was a green cement pillar with a wire cutout of Santa Claus and his reindeer on top, and small plastic dinosaurs at the base. It was two in the afternoon and the sun was ferocious. The only things moving were cars and trucks that creeped in like swimming dots from the far distance and rushed through the roundabout without even slowing down. There were some refinery towers a kilometer or so away, and a strange empty campground which looked like it might offer a touch of shade stood near the road. A road sign told me I was 1256 kilometers from Buenos Aires, and I believed it. Everything was closed and deserted, whether for siesta or more permanently. I finally got directions from a refinery worker shoveling macadam in the heat and walked along the baking main road, past the intriguing Club Anfitrion and Wiskeria Kalifornia, until I found the place immediately across from the museum where the bus had dropped off all the other passengers who knew better than to get off at the roundabout. The museum in Plaza Huincul is charming and almost deserted. One advantage of trekking out into the middle of nowhere to see dinosaurs is that almost no one comes with you. Something about the bright room, the plastic chair, and the quiet library atmosphere of the place reminded me of my third grade classroom in southern California, back when California had good third grade classrooms. I stood for a bit before a woman appeared and walked over to collect my two peso entry fee. She asked me where I was from, wrote it down, and then pointed me to the two ends of the room. One side had giant lettering that read "Museo Historico", the other side read "Museo Paleontologico". "This one is the history of city, and the other is dinosaurs?" I asked in fluent Spanish. "You are very intelligent," she said, and disappeared back into the museum. Out of some kind of misplaced feeling of pity, I forced myself to visit the historical section first. Like every other historical collection I've seen in Argentina, it consisted of a strange assortment of documents and machinery whose sole criterion of inclusion seemed to be age. The centerpieces of the collection included the first computer in Neuquén (a handsome Wang workstation), several antique bottles of napthol, a vial of jet-A kerosene, a set of old dentures, an adding machine, and a framed black and white photo of the dedication ceremony for a local bust of Eva Perón. Plaza Huincul is an oil town. Like every other oil town, it has a dreary and brief history, with before and after photos of an empty dusty wasteland turning to a dusty wasteland full of oil derricks and shacks. The text accompanying the old photos hinted darkly that the canonical story of Patagonian oil being discovered by accident, in the course of drilling for water, might just have been a smokescreen for a government that didn't want its oil industry dominated by the norteamericanos. Whether true or not, the ploy seems to have worked - the region produces most of Argentina's oil, for Argentine companies. Then again, no one here would be likely to complain if someone drilled and found water. I stood in the history room as long as I could bear it, and then went to see the biggest dinosaur in the world. I had just started reading the plaque next to a wall-mounted plesiosaur by the entrance to the exhibit when a paleontologist detached himself from a group of friends sitting in an large open doorway and walked over to give me a guided tour. He wore a kind of mullet previously unknown to science, something that looked like it had once been a mohawk but had been allowed to grow in for a year or so. "Yargle blah zhorl dinosaurio ghromple patagonico," he began. "Sorry, I understand very little Spanish"
But of course this kind of admission has yet to faze anyone in Argentina, which is one of the most pleasant (if intimidating) parts of my sojourn here. After hearing you say you can't speak Spanish, people here will smile and continue talking to you in an amused but relaxed tone, without slowing down, as if you've just shared a good joke. Incomprehension seems to really break the ice. In the case of the paleontologist, this was the best possible outcome; I was able to understand almost everything he said to me over the next half hour, to my great surprise. With the topic clearly defined, listening to him was like watching the Spanish-dubbed Discovery Channel, with its many helpful dates and latinate words, and anything I missed my brain helpfully filled in with extravagant inventions of its own. This made the local dinosaur history really leap to life. The first thing my guide told me, of course, was "look to your right", and there stood the mighty Argentinasaurus. Or rather, there stood a small portion of the mighty Argentinasaurus. Getting a full view of the skeleton requires a fair amount of backing up, since the few parts of the enormous barn-sized enclosure holding the Argentinasaurus that are not filled with neck or ribcage are needed to contain the endless series of bones that forms the animal's tail. To the best of anyone's knowledge, this is the biggest land animal ever to have lived, and the Giganatosaurus posed next to it in an agressive posture (a shout-out to the fellow paleontologists in Villa El Chocón) looks like a poodle attacking a bus. Almost all of the Argentinasaurus is extrapolated from the few vertebrae and hip fragments that were found here and are shown in a big wall case. The paleontologist explained (I think) that the body plans of these large sauropods are so well understood it's possible to do this kind of guesswork with good accuracy. The size estimate for the Argentinasaurus - around 100,000 kg - is generally accepted. An adolescent dinosaur at the height of his growth spurt gained 100kg of body mass a day. I thought there might be a gentle rivalry between Plaza Huincul and El Chocón, but the two museums are in fact on excellent terms. My guide asked me to send my best regards to his colleagues down south, and in an echo of the Giganotosaurus at Plaza Huincul, El Chocón turned out to have a replica Argentinasaurus femur in tribute to its northern neighbor. El Chocón has more of a sense of flair than Plaza Huincul, but it is unclear why. The town lies on the edge of a big artificial reservoir, and there are rows and rows of East German-like concrete huts leading down towards the water, painted in white and a rusty red that bleeds down the walls when it rains. The town is full of people on vacation; it seems these somewhat dismal huts get rented out to campers. It's impossible to miss the dinosaur museum. Big white dinosaur footprints lead towards it from the main road, and the whole town has embraced the dinosaur theme like Trelew has embraced its penguins. The museum itself is small and fun - they are so proud of the Giganotosaurus that they display it not once but three times: as a set of bones in the red earth, as a reconstructed skeleton, and as an incongruously mounted green roaring head on one of the walls. The walking dinosaur is posed like he is about to crush a red dune buggy, which a sign explains is the custom vehicle that was used to find the dinosaur's bones by its charismatic discoverer. On the wall is an arrangement of press clippings, including a lively photo of the buggy itself with a giant bone tied down on its roof, Fred Flinstone style. In the back of the El Chocón museum is a beautifully prepared and completely ignored exhibit on the local dam, including painstaking cutaways of its innards and the many pressure and movement sensors that are used to monitor its structural integrity. Like the historical section of the Plaza Huincul museum, this exhibit seems fated to a life of complete obscurity. Outside in the hallways are more fossils, various people who seem to be working paleontologists, and to my utter delight, a box full of fossilized dinosaur bones and teeth put out for the museum guests to handle. The only disappointment in the whole trip is finding that the nearby dinosaur footprints - the real ones, captured in rock - have lately been submerged by the dam reservoir. Before the footprints were identified for what they were, people here used to use them as fire pits for their weekly asado. And if the occasion were ever to present itself, I doubt the people in this meat-loving country would hesitate to barbecue an entire dinosaur. The Giganotosaurus may be extinct, but its views on what constitutes a healthy diet are alive and well in this part of Patagonia. I left Neuquén exhilirated, but also a little envious. Like video games, the dinosaurs just get better every year. Already we've come a long way from the sluggards of my youth, and I'm sure that the next generation of kids will be coloring in pictures of a three-hundred tonne cousin of the Argentinasaurus, and perhaps even playing with some new, improved version of the T-Rex that breathes fire. But at least the odds are high the cool new stuff will turn up right here. Come see it!